Fantasy Flight Games' X-Wing miniatures game is very cool - so cool that it's still part of my gift guide suggestions 2 years after it came out. 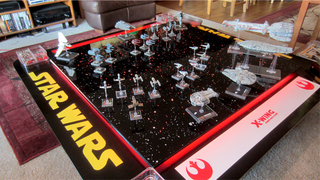 But now one fan has made a board fit for playing it on, and it looks awesome. 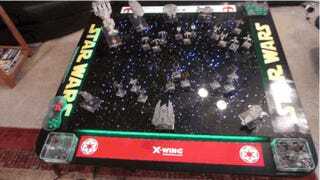 Not to be out done, Dreher apparently broke his new table in with a 5 hour long, 300 point game, and played the Star Wars soundtracks in the background just to make everything even more Star Wars-ier. Not gonna lie, the kitchen table I play on looks a lot drearier than it used to now.